Patterns of Time Roman Eagle Pencil Topper and Pencil - Pewter, New Products! 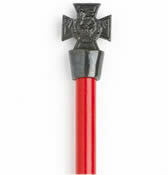 WRRE/PT - Roman Eagle Pencil Topper and Pencil - Pewter. The Roman army would carry standards and emblems of each legion. Standards were decorated with gold eagles, laurel wreaths, astrological birth signs and banners called vexilla. They were symbols of the honour and bravery of the legion and were to be protected at all costs. This highly detailed Roman Eagle is made from lead-free pewter and mounted on top of a 17.5cm blue or red pencil. 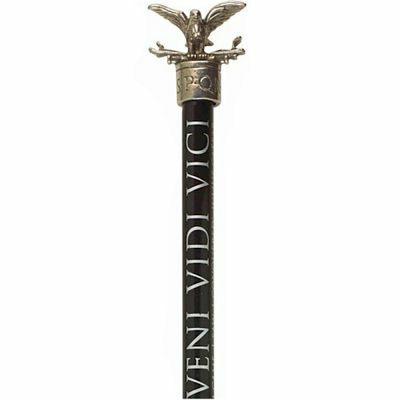 The topper is printed with the initials SPQR (Senatus Populusque Romanus), meaning 'The Senate and people of Rome' which was the mark of the Roman Empire and put on buildings, army standards and coins.